Me neither. I do know that if I’m ever lost and needing directions, I don’t want to ask the guy who wrote it. Maybe I’m just thick, but I have no idea what he is talking about. From the above verses, and many more like them, it seems elementary: God is the Father and Jesus Christ is His Son. Even more simply put, 1 + 1 = 2. Maybe that’s why in Revelation 22, the last chapter of the Bible, when all is said and done and Paradise is regained, there are only two seats on the final throne—for “God and the Lamb.” By the way, a study of the Word will show that the “Holy Spirit” is simply another title for God, and the “holy spirit” is the gift of His nature that He gives to each person when he gets born again. Many Christians are adamant that the Trinity is the “cornerstone” of the Christian faith. If that is true, what I don’t understand is why it is not clearly emblazoned on the pages of Scripture. Surely there should be terms like “God the Son,” “three-in-one,” “dual nature,” “God-man,” “Incarnation,” etc., etc. When such critical doctrines like salvation are so clearly set forth, surely the bedrock of Christianity would be plainly spelled out. 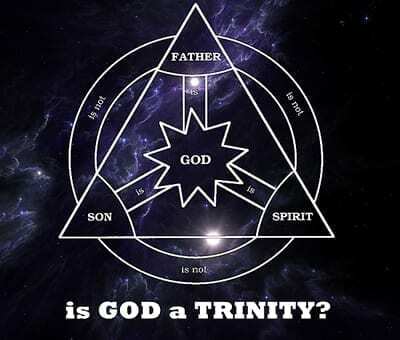 But even Trinitarian scholars admit that it is not. Have you ever wondered why? Perhaps our book, One God & One Lord: Reconsidering the Cornerstone of the Christian Faith, will help you understand the relationship between God, the Father, and Jesus Christ, His Son, as well as who the “Holy Spirit” is and what the “holy spirit” is. It will also show you where the idea of the “Trinity” came from.